He started the book during his final year at university. In March 1970, he wrote the iconic first line and the rest of the sections ”The Gunslinger” and “The Way Station” while living alone in a cabin on the banks of the Stillwater River (his three roommates had flunked out one by one, a progression reminiscent of the novella “Hearts in Atlantis”). In that cabin, he experienced ghostly, unbroken silence that undoubtedly affected the mood of what he was writing—unbroken, that is, except for the music of Johnny Winter. He believed at the time he was embarking on the longest popular novel in history, something he estimated would approach 3000 pages. This wasn’t his first stab at a serialized, Western-inspired work. He had published a political satire called “Slade” in the Maine Campus while a student. As would be the case with the Dark Tower series in the future, King abandoned and returned to the series of stories that became The Gunslinger over the ensuing years. He wrote “The Oracle and the Mountain” while having trouble in the midst of ‘Salem’s Lot and “The Slow Mutants” after he finished The Shining. He says that his mind did not turn at all to the world of Roland Deschain only while he worked on The Stand. The final segment, “The Gunslinger and the Man in Black,” (also known as “The Gunslinger and the Darkman”) was written in 1980. He showed a couple of the stories to his agent, Kirby McCauley, who sold them to Fantasy & Science Fiction magazine. The first, “The Gunslinger,” appeared in the October 1978 issue, shortly after publication of The Stand. The second installment came out in April 1980, and the last three appeared in rapid succession in February, July and November 1981. With the final installment came the announcement that the five stories would be collected in a limited hard-cover edition by Donald M. Grant in the spring of 1982. Until he talked with Don Grant over dinner one night while he was at Providence College on a speaking engagement, King had no plans to republish the stories. The story was incomplete and he considered it a radical departure from his other works that was unlikely to appeal to his readership. Grant asked him if he had anything that would lend itself to a limited edition from his small press, and King suggested the Dark Tower stories. He rescued the wet and barely readable manuscript from a mildewy cellar and tweaked the stories for publication. He dedicated it to F&SF editor Ed Ferman for taking a chance on the stories one by one. Grant enlisted award-winning illustrator Michael Whelan to work on the book. Whelan had previously created drawings for the limited edition of Firestarter. Despite the announcement in F&SF magazine and an advertisement in an issue of Whispers magazine that featured artwork inspired by The Gunslinger, the book escaped the attention of most of King’s readers when it was published in 1982. By the time it was listed on the author’s ad card at the front of Pet Sematary the following year, the 10,000 copy trade edition (the largest small-press edition in history at that time), plus 500 signed copies, had sold out. King’s office and his publishers were bombarded with letters asking how to acquire the book. Doubleday alone reportedly received over three thousand letters. Some of the letters were less than pleasant—readers felt they had the right to read anything King published. He and Grant discussed the situation, and a second printing of 10,000 copies was authorized. It started shipping in January 1984 and was out of print by the end of the year. The book’s text and layout remained unchanged from the original printing. Other than the copyright page information, the only difference was that a four-color process was used for the endpapers of the first printing, and for the second printing a single-color process was used. Soon, even the second printing of the $20 book was commanding as much as $100 on the secondary market. King’s semi-official newsletter, the Castle Rock Newsletter, received many letters from fans who couldn’t afford the book. Though there was much pressure for a mass market edition of the book, King resisted until late 1988, when a Plume trade paperback version was published, along with an audio version recorded by King in the studio at his radio station, WZON. The six-hour, four-cassette package was the first of King’s novels to be released on unabridged audio, and the first to be recorded by the author. He wasn’t far off—if anything he exceeded the page count if you include The Wind Through the Keyhole. Astute listeners report hearing transports rumbling past the station in the background of the audiotapes. great story! i finally ordered this on Audio (could never bring myself to finish reading Book 1! Looking forward to the story. Thanks for the report. Love that image! One of my favorite ones out the entire Dark Tower art catalog. 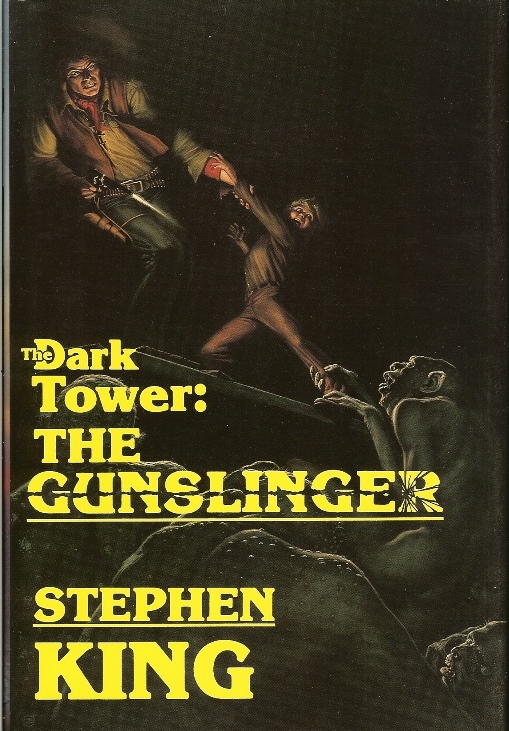 Always fun to read about the original The Dark Tower: The Gunslinger tome by SK. I missed out on the first edition, first printing of this book but was able to get a first edition, second printing (unsigned) when they were made available. Twenty dollars was hard to come by back then but I think I made a very good investment. I still have it in my collection. It has only been read twice and handled not much more than that. So with retirement down the road in five or six years…it might be time to consider selling this great book. Just thinking out loud here! Wonderful info Bev, as always. Loved reading The Dark Tower. The Gunslinger especially. Great books!! The Gunslinger was the first audiobook I ever purchased…cassettes as mentioned in the article. I bought that and the paperback at the same time and read along to Steve as he narrated. I then bought the CD’s narrated by Frank Muller. in the end, I have all of the Dark Tower series on CD, narrated by either Frank Muller or George Guidall. I have all of the DT S/L books with the exception of The Gunslinger….I just couldn’t rationalize the expense. Now I wish I had. The books I do have are all matching numbers and this does include The Wind through the Keyhole. I got lucky.